At St John's Chelsea, the casework was designed by ourselves in close cooperation with the architects of the new church. Details of the casework are derived from design features of the building, including the decorative motifs in solid brass. In this instance, it was felt to be appropriate to have the swell front as part of the façade of the case. The temperament was actually devised by John Mander to be more suitable for the English liturgy than Vallotti sometimes is. Some years later he discovered that Alexander Young had already invented the tuning in 1800. It is often said there is nothing new in organ building! 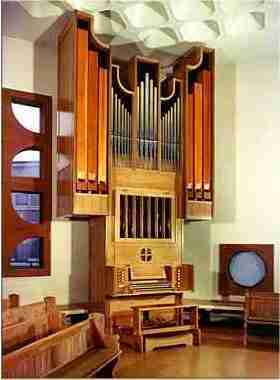 Although small, this organ was designed to be a versatile instrument for a small church seating some 250 people. It has a wide dynamic range and is well suited to the accompaniment of even a large congregation. It has proved a popular instrument for organ practice because of its versatility and sensitive key action. Both key and drawstop actions are mechanical.